Facebook on Monday began rolling out a new feature — Live Location — to its Messenger apps for iOS and Android, just days after Google announced a similar feature for Google Maps. Unlike Google's option, Messenger sharing is limited to 1 hour. People will in fact see a clock in the lower-right corner of a map indicating how much time is left, and have access to a prominent "Stop Sharing" button for ending tracking immediately. The feature meanwhile incorporates ETA estimates for car travel, which can be seen by both senders and recipients. At the moment the new technology is still rolling out worldwide. 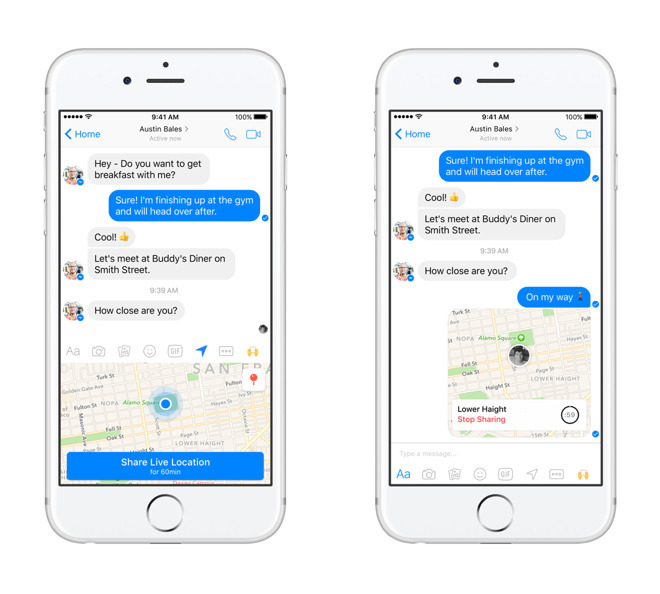 When available, it can be launched in the same way as the static location sharing Messenger has had for some time. Apple offers somewhat similar location tracking in the form of Find My Friends and Messages, including travel ETAs and time limits. Both Apple and Google offer options to share location indefinitely in the case of trusted people, like family. Apple Maps also lets users share their location, but in static form.